Today has been one of those days. Tough. Sometimes life is like that. Tough. And I’m reminded that God doesn’t give us more than we can handle. For any of you pet lovers out there, you know pets are more than just things. They are family. 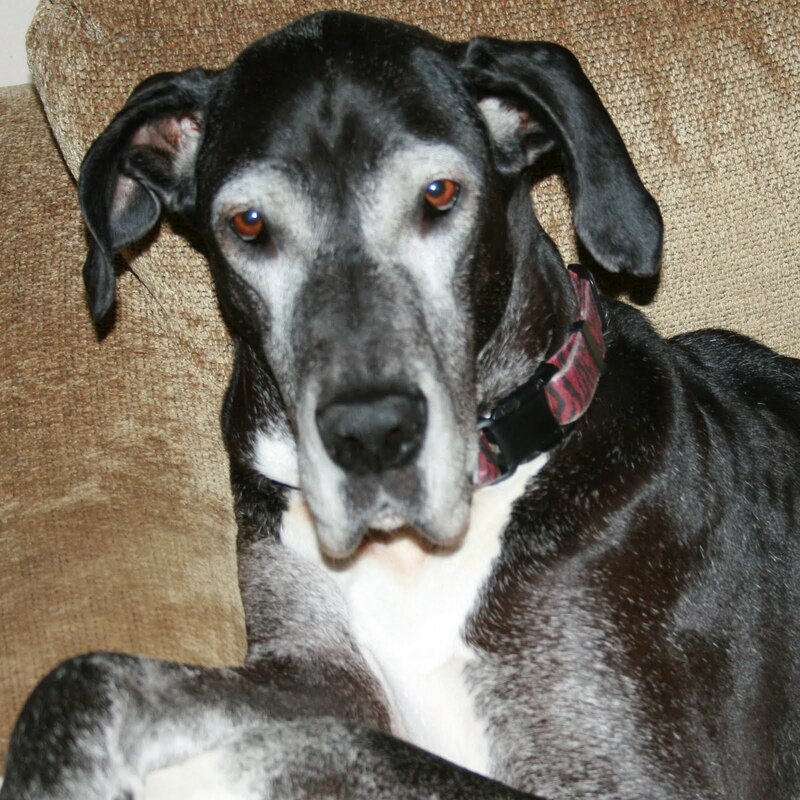 Our Great Dane, Zoe, has been in hospice care with us for the past six months. This morning she passed away peacefully surrounded by all of us who loved her dearly. She became paralyzed in March and was diagnosed with cancer. The veterinarians didn’t think she’d make it to summer, but typical Zoe she was a fighter and wasn’t going to have any of that. So she continued with her bright spirit and keeping her brothers and sisters in line all through the summer. She was such a good girl, and we were so blessed to be able to spend this summer with her. I saw a saying on Pinterest that says, “Love the people God gave you because He will need them back one day.” I definitely believe this applies to your animal family too. So, for all of you remember to hug and say “I love you” to those that you love today. Good Friday Morning Everyone! 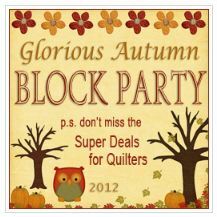 A couple of weeks ago I announced the beginning of the Quilting Gallery’s Glorious Autumn Block Party. Have you been checking out the blocks? Have you made any? If you’re new to this, you can find the first 3 weeks blocks here. There have been some really beautiful blocks. For fun, we decided to make our own versions. Here are the first four. I hope you are enjoying the block party and the great deals each day! Have a great weekend! Hi Everyone, I have wanted to do an appliqué tutorial for some time, but wanted to do something a little different than just share how I do appliqué. So, I came up with the idea to share a pattern, show you my favorite appliqué technique, and along the way also share some tips I’ve learned along the way. One of my favorite things to have around my house is standard size bed pillows with fun shams. These are great to get cozy with and are less expensive than a lot of the custom sized pillow forms. They are also easy to change out based on your decorations and the season of the year. I chose to make my first pillow using a Halloween theme. – From the background fabric, cut 1 piece at 14½” by 24½” and 4 squares at 3½” by 3½”. 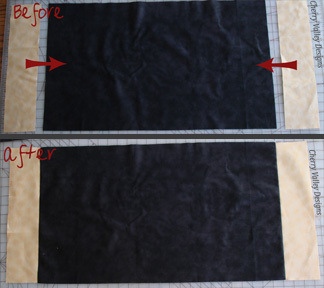 Sew the side borders to each side with 1/4″ seam allowance and press seams towards darker fabric. 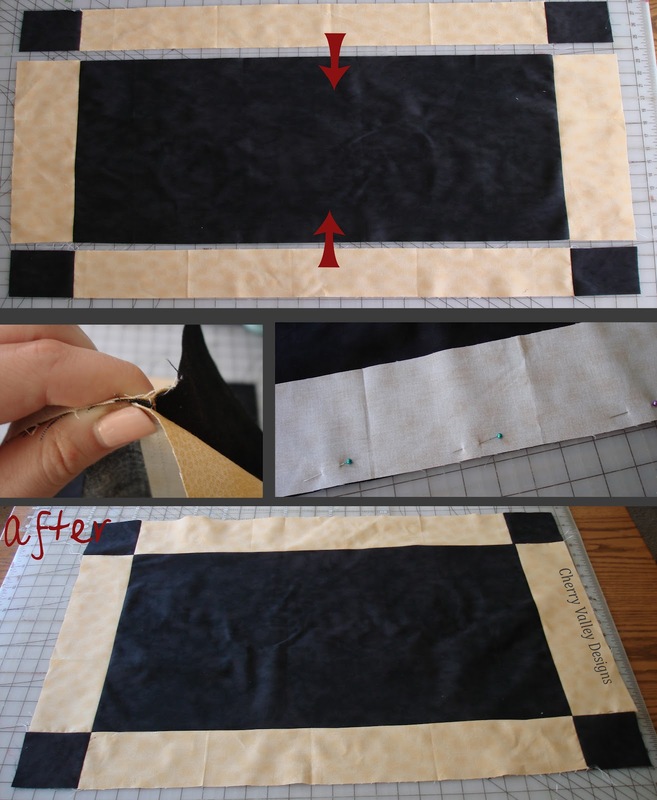 Sew the squares to each side of the top & bottom borders. You will have 2 when finished. Sew the borders from Step 3 to the top and bottom of the pillow background sewn in Step 2 making sure to line up the corners and pin frequently. Once sewn, press seams towards darker fabric. Now the fun! Appliqué! I like to keep my appliqué technique simple, quick and to the point. Appliqué is an awesome way to add uniqueness to a project and it’s super fun! I use Heat ‘N Bond Lite and have found that this works really well on a multitude of projects, but will tell you about some tips & tricks I’ve found along the way. I get mine at Joann’s and because I use so much I like to wait until there’s a good coupon and stock up on 5 yards, 10 yards or even a bolt of Heat ‘N Bond at a time … yes, that’s how much I love this product. 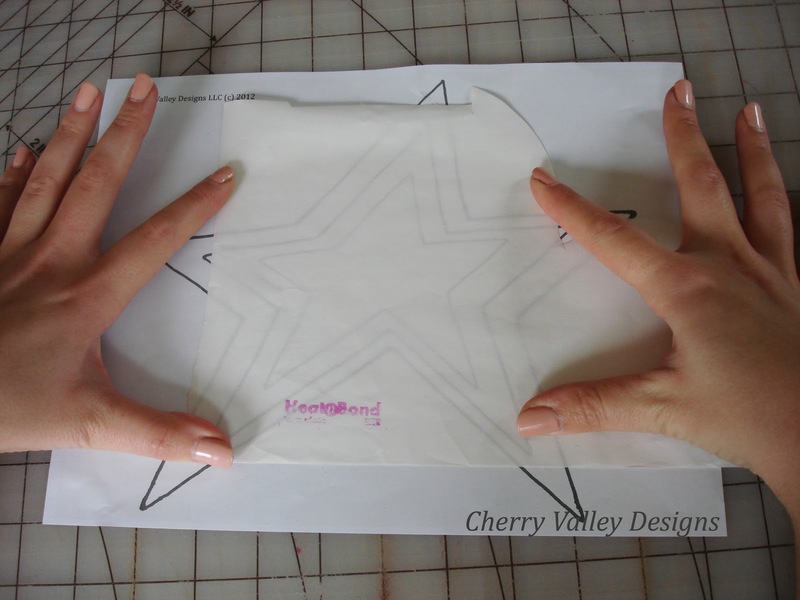 You will want to trace the stars you would like to use onto the Heat ‘N Bond. There are six options I have given you attached here and here. 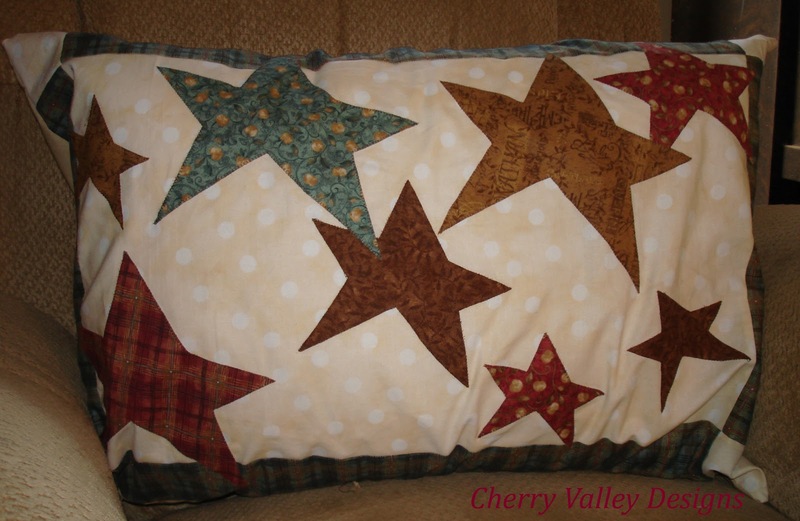 I used a combination of 3 left leaning and right leaning large stars, 2 medium stars (1 left leaning and 1 right leaning), and a combination of 3 left leaning and right leaning small stars, but you can use any combination you’d like. From here, you will want to cut around the stars. 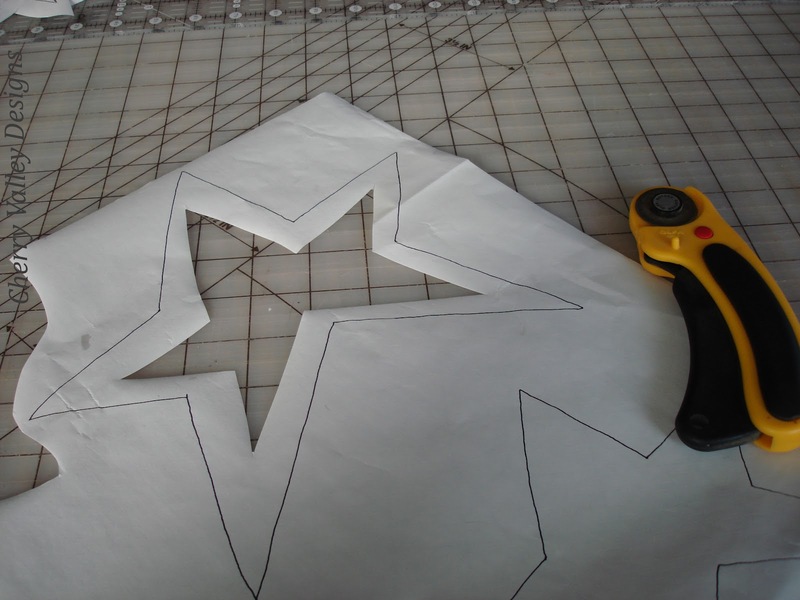 One of the things I struggled with when I first started appliquéing was when to cut the centers out. So, I wanted to make sure I gave an example of when to cut and when not to cut in this tutorial. 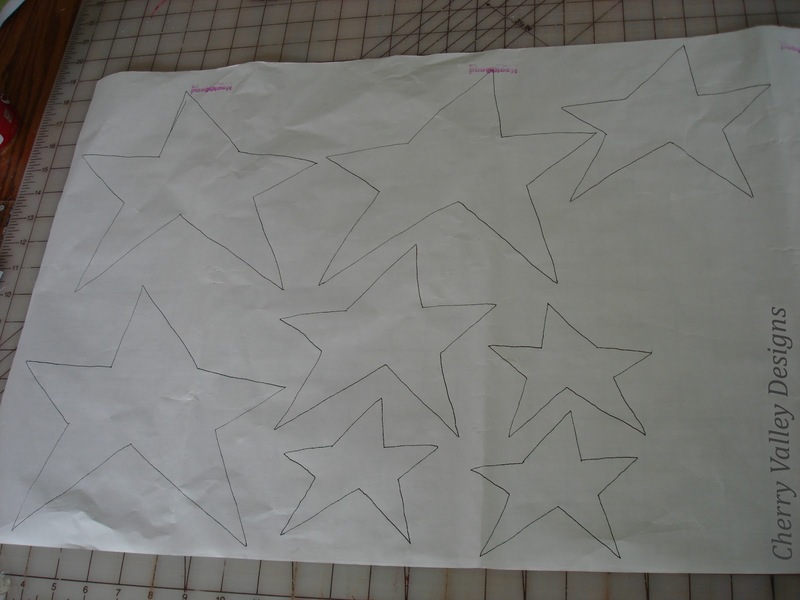 For the large and medium size stars you will want to cut out the centers, not the small stars. The reason for this is it simply helps eliminate the bulk of the final project. Heat ‘N Bond tends to make things stiff when used, so by cutting excess out you are cutting down on the bulk. 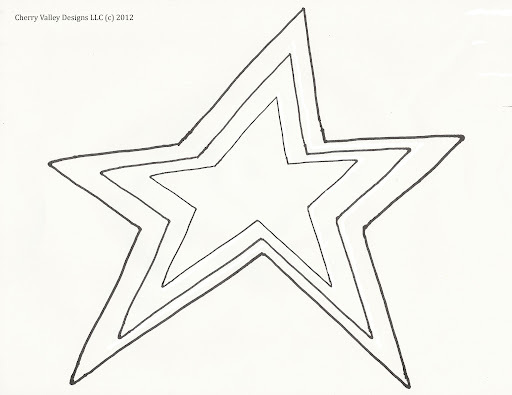 Below is an example of what a large star will look like when the center has been cut out. I have a tiny (28 mm.) Olfa rotary cutter that I use, but you could use scissors or a larger rotary cutter. Using a rotary cutter gives a very smooth edge, but if you use a larger rotary cutter be careful to not go too fast, because a larger surface is being cut and you don’t want to cut through your outline! Iron the non-paper surface of the Heat ‘N Bond to the wrong side of the fabric, cut out the stars along the edges and take off the paper backing so your “glue” is showing. Place your stars where you would like them and when you are sure of their placement iron them in place. 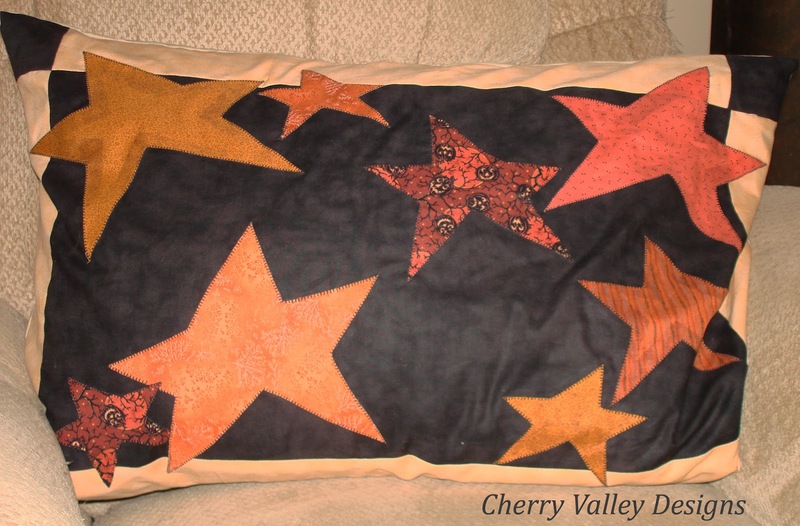 Once your stars are ironed down, you are ready to sew your decorative border to secure them permanently. I prefer to use the blanket stitch for all my appliqué. Occasionally I will use the zig zag stitch, but definitely experiment with your machine and some scrap material to see which you prefer! If you have never appliquéd before I highly recommend you take some scraps of fabric and test your blanket stitch to get comfortable with it and to see visually how it looks. Make sure you put your needle in the Needle Down position. 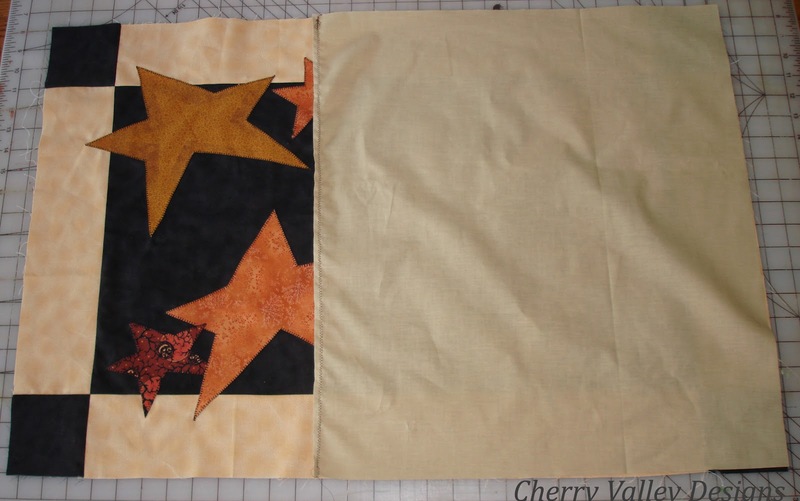 This is especially important for when you rotate your stars corners to keep your needle in place. 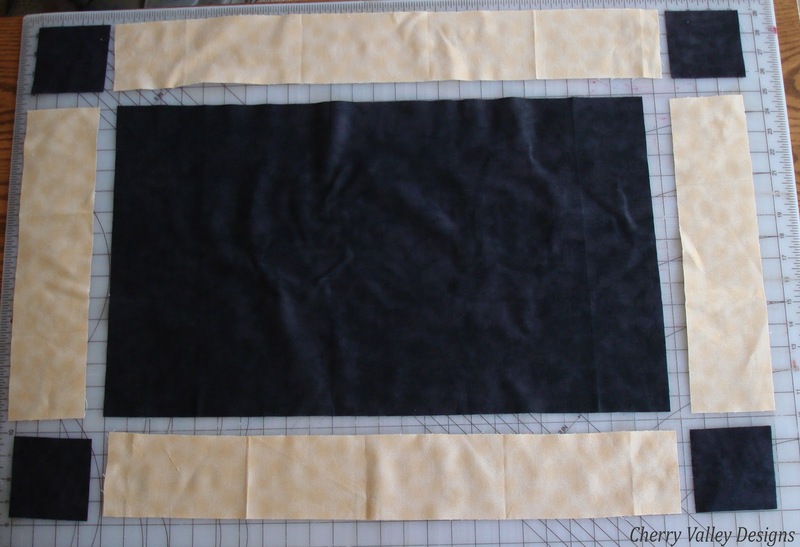 It’s also helpful if you need to readjust you fabric in the middle of a line. And then sew down with a zig zag stitch. Now you’re ready to put everything together and have a finished pillowcase! Lay the 18½” by 20½” piece face down (so your raw edges with the zig zag are facing up). 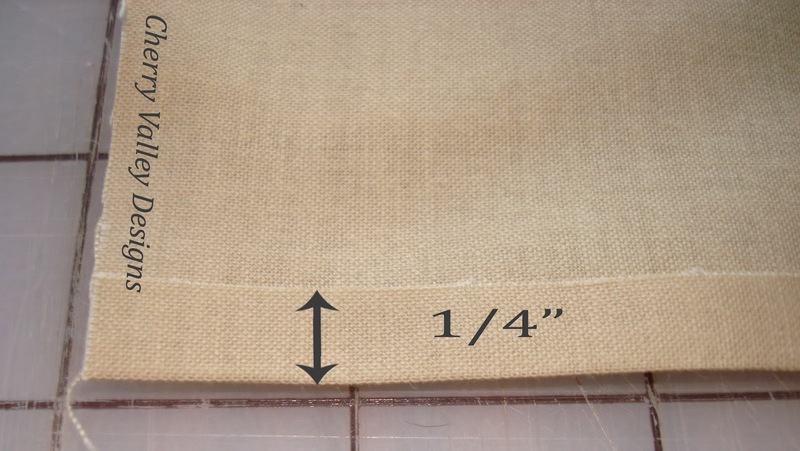 Next, lay the 15½” by 20½” piece over this so the entire front of your pillow does not show and pin down frequently. 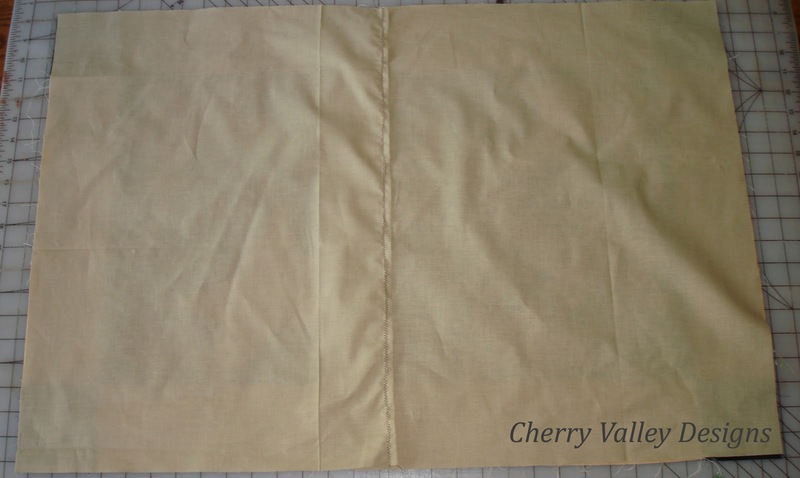 Sew all around the pillow sham at 1/4″ seam allowance and turn inside out … voilà … you are done! For another idea on what this pillow could look like, here’s a different spin. This pillow has endless options … Christmas, 4th of July … on and on and on! I hope you have enjoyed this tutorial and I would love to see your finished pillows (you can send photos to my e-mail at meganeziegler@gmail.com)! Hey Everyone! 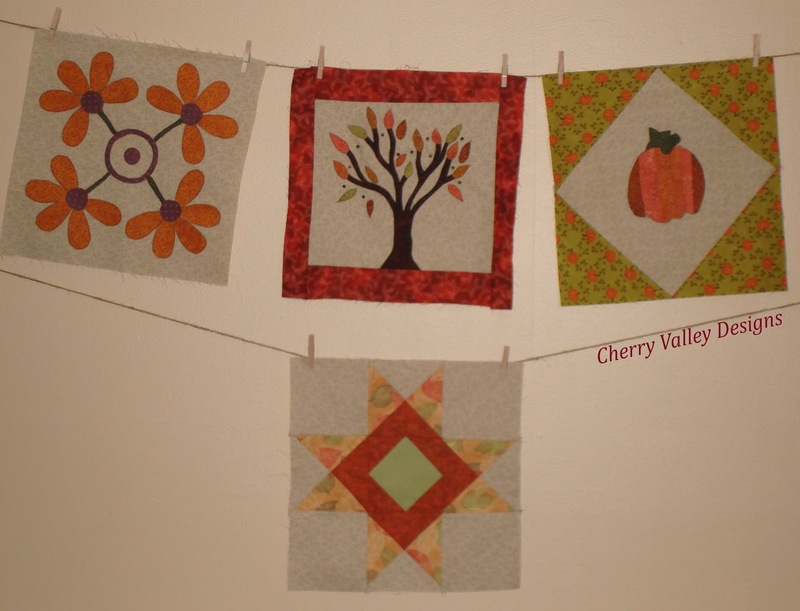 I am super excited to be sharing the news with you that today is the first day of the Quilting Gallery’s Glorious Autumn Block Party and even more excited to announce that I’m going to be one of the 45 featured designers with blocks. How it works? Every Tuesday, Wednesday and Thursday for the next 15 weeks there will be a new block unveiled by a featured designer. Yep! That’s right, 45 blocks! Imagine the quilts you can make from all this quilt-spiration! 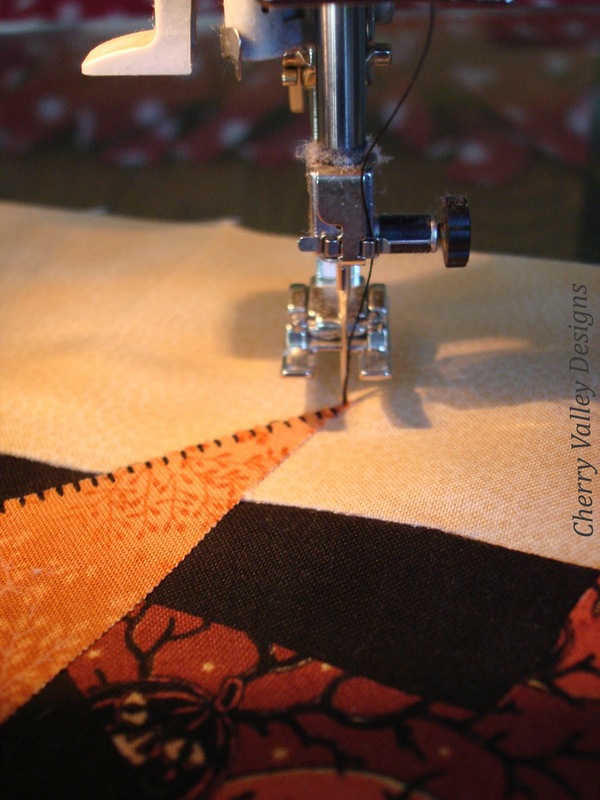 Each block will measure 12″ finished (12 1/2″ unfinished) and will in some way tie into the Glorious Autumn theme either through design or the fabric used. So get ready to sew and have fun along the way! My design will be featured Tuesday, November 20th and I can’t wait for the big unveil. To get started, the party will kick off with the super popular Pat Sloan (or you can see her block and an interview on the Quilting Gallery’s website here), so check her blog out! !